Where does the time go?! This event marks our official 2 year Anniversary of our FREE 5K Fun Run Series!! It is our sincere hope to match or beat our registration numbers from that first event (114 participants)! 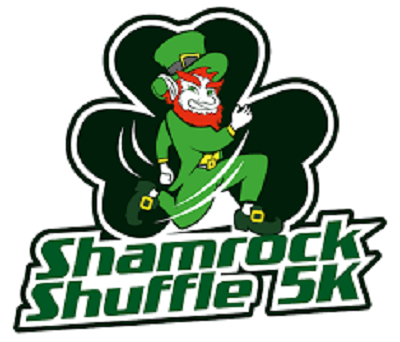 So get out your green, your shamrock necklaces, your leprechaun hats and come join us for the 2nd Annual Shamrock Shuffle FREE 5K Fun Run on Saturday March 18, 2017. We began this event series back in 2015 with the Pi Day Run (3/14/15), and have successfully continued to offer a FREE race series that gives back to the community with each and every event. We will continue that with this month’s event by collecting GIFT CARDS to be donated to the St. Michaels High School After Prom Party Committee. Each year, a group of volunteers (mostly parents), work together to produce a safe, alcohol- and drug-free “party” for students immediately following Prom. Throughout the evening, students that attend are eligible to receive various door prizes for pledging to remain drug- and alcohol-free! Examples of gift cards to donate can be anything from gas cards, grocery cards, Amazon cards, ITunes cards, etc! As usual, the race will begin at 9:00am. On-site registration and bib pick-up will begin at 7:30am inside the shop. Our FUN RUN series is designed to be just that….FUN! We keep things fun by having the fun runs set up as prediction races. What is a prediction race? We ask you to try and guess your finish time and then, the participant that comes closest to their official time is declared a race winner! Any participant that guesses within 10 seconds is declared a winner in our book. Sound like fun? You should come give it a try! Some races we have no winners, and some races we have had 10 winners! We hope you can join us for our 2 year CELEBRATION! Please plan to park at St. Michaels Elementary School (Seymour Ave.) then make the short walk down to the shop. Our pre-race meeting will begin at 8:45am in the front parking lot. Stay tuned for some FUN post-race activities to be announced soon as well!